Hot off the presses! Our 2019 Training Trends Report is available for download. As a new year kicks into high gear, changes in technology, learner demographics and preferences are creating new challenges and opportunities for training and continuing education professionals. For the past three years, Omnipress has surveyed over 100 continuing education and training professionals from associations, corporations and other organizations to understand how education is being delivered to learners today, and which trends training professionals are keeping an eye on for the future. 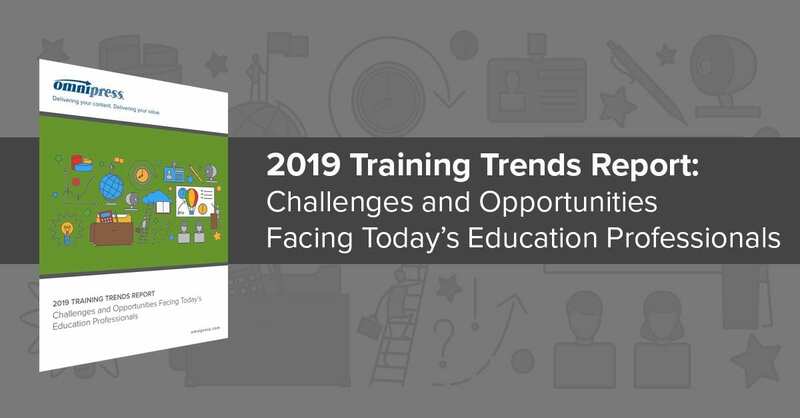 This year’s report highlights just how valuable training and education is for organizations, as most have plans to increase the breadth and depth of their programs in 2019. But for training professionals who already manage a significant content portfolio and a wide array of responsibilities, this additional growth may create strategic tradeoffs. For instance, this year’s report indicates that 51% of respondents currently offer at least 11 different programs or courses, with 60% of respondents expecting to increase that number in 2019. Education professionals are also delivering this educational content in a variety of formats to address the diverse preferences of learners. As a result, respondents are spending more time than they would like on tasks such as managing content changes, and less time on strategic initiatives designed to advance and grow the organization. What are some other key findings in 2019? The purpose of this report is not just to shed light on common trends, but to help spark a strategic conversation on how organizations can leverage their greatest asset—educational content—to strengthen their connection with new and existing learners. Download the free report to read the full results.